Free to play. Free. To. Play. Sounds good, but watch the fine print. With most games these days, when something is free, you tend to get what you pay for. Generally, you'll end up getting a fraction of the actual game with the rest being either unattainable or incredibly hard to get to without pulling out your credit card, or you'll be bombarded with messages asking you to fork over some cash in order to get rid of the messages asking you to fork over some cash. Most games will show you the gold-plated doorway and sit back with arms crossed saying, in a non-verbal manner, "if you want to get into the club, you gotta cough up the green." But not all of them are like this. There is an emerging faction of games that offer genuine quality content with the option of paying if you want to, but not using subtle underhanded tactics to loosen your purse strings. In Japan, two major games have recently stood out as pioneers in this field; Phantasy Star Online 2 and Mobile Suit Gundam: Battle Operation. Both games offer most of their content to players without ever having to pay anything. Granted, the content that can be purchased can further enrich the game experience or speed things along to a certain extent, but the option to pay is never as overbearing or as big an annoyance as in other games. In an interview with Weekly Famitsu, producers Satoshi Sakai and Yuuya Kimura from Sega and producers Ken Kuwahara and Satoshi Oono from Namco Bandai sat down to talk about their respective games and the Free to Play style in general. The concept [of a full game being free] was met with resistance within the companies that made them. For both Sega and Namco Bandai, PSO2 and Gundam Battle Operation were experimental endeavors. Both games were initially created to increase the fanbase for their respective properties as well as to help introduce people to online games in general. While players would obviously welcome the concept of a full game that could be played for free, the concept was met with resistance within the companies that made them. "The biggest point was trying to figure out how to deal with the fact that nothing like this had been done on a platform like the PS3, and that it was impossible to tell if we would be able to turn it into a profit at all." said Kuwahara recalling his experience in Namco Bandai. Sakurai recalls a similar experience at Sega, "Of course we were met with a certain degree [of resistance], but in regards to the fact that we believed that Free to Play would be the model of the future and that it would spread awareness of Phantasy Star Online, a lot more people were understanding than we expected. But there was a general worry as to whether we'd be able to make back the development costs." Kimura added, "We pulled together a lot of information and tried to speculate the potential numbers, but to be honest, we had no way to be sure." In terms of the pay-for content, the games differ in the style of content available. For Gundam Battle Operation, players can pay for extra deployment energy to increase the amount of times they can deploy per day (Max without paying is 12 times), or to unlock the enhancement limit on weapons or robots, or for special custom parts to boost exp and other benefits. Of these, deployment energy is the main focus of where players' money goes. Players start with 3 units of energy. Each mission they play costs them 1 unit of energy. Every 2 hours, they automatically regenerate a unit of energy, but deployment energy cannot be stocked beyond 3 units. "Even if it's free," Kuwahara explains, "if people continue to play, there's a chance that they may decide to pay somewhere down the line. At present, this model seems to be working." The limit unlocks and other enhancements were initially not very sought after, but as players have increased in level, recently there has been an increased demand. "Even if it's free," Kuwahara explains, "if people continue to play, there's a chance that they may decide to pay somewhere down the line. At present, this model seems to be working." For PSO2, it was always a policy not to make players pay for areas of gameplay. The main pay-for content currently comes in the form of lottery tickets that give players articles of clothing, accessories or enhancements. One unique aspect of the game is that how a character looks is not tied to their status parameters, so you don't end up with high level characters all looking the same even though they're using the same equipment. "A lot of people would say to us that, ‘you should add parameters to costumes.' But I think we were successful because we didn't." remarked Kimura. Another pay area is the Premium Set which increases the functions of item storage and player rooms, something non-vital to play the game, but that does expand on it. 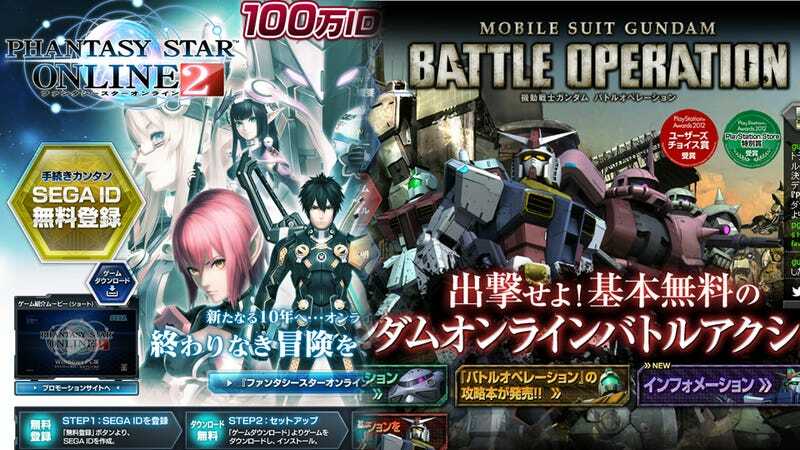 Gundam Battle Operation currently has over 700,000 users. PSO2 has over a million registered users and around 300,000 active users per month. Both games look to be aiming for the long term playability. Rather than giving their games a cover charge, like other games, they seem to be focused on a full experience to hook players in and potentially convince them to pay further down the line. Overall, while potentially more risky than games developed with a short-term profit model, once successful such games can offer a more stable and secure flow of profit. While these two games are pioneers and experimental, all parties involved believe that they won't be the only ones and that there will definitely more games that follow this model in the future. "I believe there will be more games like this, but I don't know if they will be on consoles." said Sakurai. Whichever way these games evolve, being able to play them for free is always pretty awesome. Mobile Suit Gundam: Battle Operation is available in Japan on the PS3. Phantasy Star Online 2 is available in Japan for the PC. A PlayStation Vita version is scheduled for release on February 28th, 2013.